With motor shows being one of the most popular events for all car enthusiasts, I am pleased that our Bangkok International Motor Show is now accepted overseas as one of the major shows in SE Asia. Being held at the huge BITEC events and exhibition area at Bangna, with parking for 4,000 vehicles means that our world class motor show is held in world class facilities. The dates to pencil in to your calendar are March 25 through to April 3 (the weekends are March 26/27 and April 2/3). 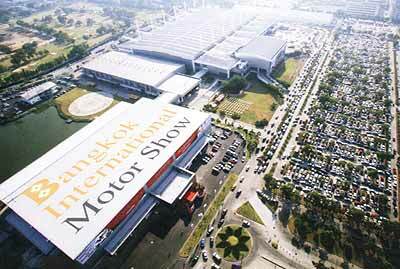 There are already 130 exhibiting companies from 11 countries and eight motorcycle brands represented. With the world’s attention on the dwindling (expensive) oil supplies (that George Dubbya didn’t managed to expropriate while waging the War of Mass Deception), you can expect more small cars and econo-misers this year. The theme is “The power of natural” so I would think there will be even more alternative power sources being touted, though I still believe that Hydrogen power will win in the end. Other attractions at the show are the displays from some of the car clubs in Thailand, with the Mustang club showing some of the best restored examples of the famous Detroit pony cars, as well as the Mini club, the VeeDub group and some classic vehicles as well. This is where you can see a classic Mercedes Benz 300 SL Gull-wing if you are lucky. The important motor shows in the first quarter of the year are the Detroit Show in January, the 74th Geneva International Motor Show in early March, and then the Bangkok International Motor Show. The other two Asian shows are the Sydney International on October 13 and then the Tokyo International October 19. Motorcycling is a learned skill, though some of the local taxi motorcycle riders are obviously slow learners. However, when it comes to motorcycle racing, it is more of an art form than anything else. But what should not be forgotten is that the skills necessary to compete can also be used to stay alive on our roads. HighSideTours (HST), a Bangkok initiative, has just completed its first three day motorcycle race school and track days session at Bira International Circuit, Pattaya. The event was attended by several local and international press and magazine journalists as well as customers from four different countries. At this initial offering, eight riders took part in the race and riding school instruction (two Germans, three from the UK, one New Zealander, and two Italians) offered over the three days by qualified instructors of the Superbike School. Riders received one-on-one tuition to learn such skills as how to sit on the motorcycle correctly, corner entry, braking points and throttle control. Dramatic improvements in skill levels and speed were achieved by all who attended, with two riders achieving their life-long biking dream of ‘knee down’ by the end of day two! 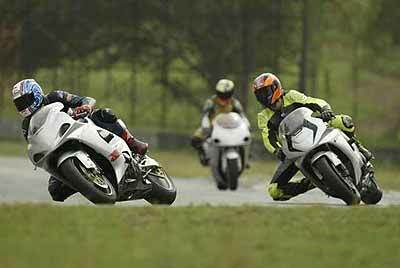 The bikes used were race prepared examples of the famous Suzuki track bike GSX-R 750. All bikes were kitted out with upgraded brakes and exhaust systems as well as race transmissions. These bikes are ideally suited to the technically demanding Bira Circuit and were individually set up for each riders weight and skill levels. Feedback for the Bira Circuit was universal praise, with experienced motorcycle instructors and journalists who have ridden on such famous tracks as Phillip Island, Australia and Donington Park, UK were full of praise for the circuit named after Prince Bira, Thailand’s first truly international sporting champion and hero. Turns 1 and 2 of the circuit were considered by some to be the most challenging corners they had ever ridden! The three day format was popular with the riders as it allowed them to develop their skills at their own pace and to enjoy more of the social side of the event. After a first day of acclimatizing and adjusting the bikes, riders were able to spend two full days concentrating on their skills and practicing the drills. A full selection of bike DVD’s were on offer in the paddock tent to relax the riders whilst planning the next session. The luxury paddock tent proved very popular as a place to relax and discuss the events on track. Free soft drinks and lunch were provided by the very attractive and attentive HST hostesses, as well as cold towels and assistance in getting in and out of the leathers. Riders could sit and relax watching MotoGP videos whilst their own bike was being refueled and settings adjusted by the HST mechanics. Almost like being a real MotoGP factory rider! The HighSideTours track days are normally offered as a three day package for US$1,500, however due to the demand, and time constraints for some riders, HST has added a one day track day experience option (with slightly reduced content) for US$400. All packages need to be pre-booked through phone or website at www.highsidetours. com. For more information please contact Graham Knight 09 119 0000. The next track days are February 18-20, but as places are limited, I would suggest an early booking would be advisable. I hope to be there myself, as my skill levels on a motorcycle are decidedly rusty! It certainly isn’t news that Mitsubishi is in deep doggy doo back in Japan. A very poorly executed manufacturing fault cover-up has led to the execution (metaphorically) of senior staff in Japan, who have all fallen on their swords. This is turn led to shareholder DaimlerChrysler withholding ‘bail-out’ funds, and it just didn’t get any better from there! A Mitsu they do not make here! However, what must not be forgotten, is that Mitsubishi can make some damn good vehicles, and many of them are made here in Thailand and exported. Last year, Mitsubishi were the export leaders from Thailand, and the latest figures I could get, covering 10 of the 12 months had Mitsu the top exporter at 70,856 units (CBU vehicles), followed by the AutoAlliance (Ford-Mazda) at 58,894 and Toyota third at 43,691. In October, Mitsu exported almost twice as many vehicles as the AutoAlliance, almost three times as many as GM and Toyota and four times the number exported by Honda. Mitsu isn’t lying down either, despite head office’s problems. A couple of weeks back I mentioned the 10 year warranty being offered on new Mitsubishi products in Australia and in Thailand, Mitsubishi are embarking on an improved corporate identity plane, face-lifting 82 showrooms throughout the country this year. Crash-proof cars - are they here? Crash-proof cars would change the world so dramatically that I doubt if anyone has really thought the whole concept through. What should be a boon to mankind could reduce living standards by so much that the financial effect could bring some local economies to their knees! The panel shops are out of business for starters! Now think about the costing situation. Cars that can get us out of trouble would not need the costly air-bags and other secondary safety features. Crash-proof cars working on primary safety would revolutionize the entire auto industry, as well as negatively affect the cash flow in the undertaking industry in the short term! Technology is continuing to look at ways that the motor vehicle could be made to avoid crashing into its surroundings. Let’s look at the reversing warning beepers that are commonplace these days. By ‘bouncing’ a beam off solid objects behind the vehicle, an audible warning is produced. As the vehicle gets closer to the solid object, the auditory warning increases in frequency and volume. A larger and more sophisticated version of these, ‘looking’ out of the front of the vehicle could activate the brakes electrically. Toyota has an interesting vehicle called the Estima hybrid minivan and features a regenerative braking system to improve fuel consumption. The Electronically Controlled Brake (ECB) system was engineered for high levels of environmental technology, and - safety. Toyota engineers say it can control both the braking and driving functions of the hybrid system. Note that - control of braking and driving functions. Mitsubishi Motors Corporation is another automaker involved in this type of research and developed the Mitsubishi ASV-2 (advanced safety vehicle). The ASV-2 uses IT technology applied to the company’s advanced Active Safety accident avoidance and Passive Safety crash injury and damage mitigation technologies. Here comes the ‘brave new world’ so read the following list carefully and remember the analogy of the reversing warning systems. Central to their safety system is the Multi-eye that uses wireless radar to detect the distance to the vehicle in front and the relative vehicle speeds; laser radar with advanced analytic capability; cameras that respond to significant changes in driver alertness, and a variety of sensors that detect and monitor the road environment. Other equipment includes steering actuators, brake actuators and other components that support the driver in his operation of the vehicle. Rear-side Monitor uses wireless radar installed in the door mirrors and a camera mounted at the top of the rear window to monitor automobiles, motor bikes and bicycles in adjacent lanes. The system alerts the driver of the presence of vehicles overtaking or driving alongside should he start to change lane. It also generates a “warning” torque through the steering wheel countering the direction he is turning. Remember this point, it is very significant. Advanced preview distance control. This system uses the wireless radar, installed in the front grille, that monitors inter-vehicle distance and relative speed; wide-angle scanning laser radar, fitted in the front grille, that provides superior detection of vehicles cutting in from another lane or of vehicles close ahead; plus the camera fitted in the rearview mirror that detects vehicles cutting in from another lane. This system uses these components to regulate inter-vehicle distance with the car ahead. Should the car in front stop, the system automatically applies the brakes. Now while these systems sound wonderful, there is a cost, and it is not just the cost involved in the technology development and fitting it into the vehicle. This other cost is driver freedom. The vehicle that will not crash is here now, but it does not just tell you to brake, but does it for you. It can stop you changing lanes. It can make you slow up, whether you want to or not. For this technology to work, you have to accept that ‘Big Brother’ knows best. It’s a little like Arnie and the Terminators. The machines are here! Are we prepared to give up our powers? Somehow I think not. Crash-proof cars are possible, but we must submit first. Think about it. Last week, I asked which motor car designer described his gearbox as follows, “C’est brutal mais ca marche!” The clue was that he was French! Another clue was that the car was made in Paris. The answer was Emile Lavassor, who was co-designer of the first ‘conventional’ motor car, with a vertical front engine, foot operated clutch and a gearbox. This car was produced in 1891 and was just called a Panhard et Lavassor. So to this week. A designer produced a car in 1937 that featured front wheel drive and rear wheel steering. What was his name? That should get the Googlers going!